Experts say many of us now keep our homes so cozy that we no longer have to burn as many calories to naturally warm up our bodies. 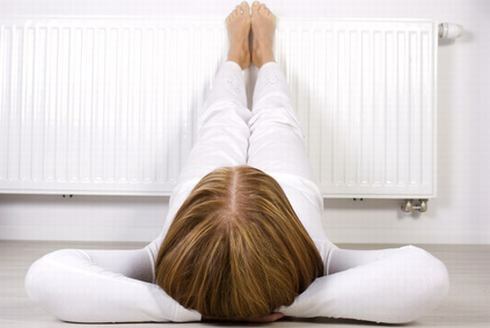 The study finds that modern centrally heated homes are helping to send obesity rates soaring. Scientists from University College London say it is an increasing problem across the developed world where average indoor temperatures are constantly rising. The recent study out of the journal Obesity Reviews notes that it's not just diet and activity levels that have changed in correlation with rising obesity numbers, but ambient temperature. Central heating became common in developing countries including the U.S. and U.K. around the 1960’s. Now commonly people are heating their homes at all hours of the day, even as they sleep, and spending less time outdoors exposed to the elements. Central heating is more common, while space heaters, fireplaces, and electric heaters are less common, meaning the entire house gets and stays warm. People in developed countries exist in relative thermoneutrality: a nice 68-72 degrees F. The authors guess that with less exposure to thermal stress, we’re burning fewer calories. Our bodies have an easier time regulating our internal temperatures, and expend less energy doing so. And its impact on weight is made worse by the extra time we now spend indoors, whether working from home, watching TV or shopping online. Even when we do venture out, it is often via heated cars or other transport to offices and workplaces where the temperature is carefully controlled by air conditioning units. The research said there was a direct link between ‘reduced exposure to seasonal cold and increases in obesity in the UK and U.S.’. If the body is already warm it does not need to convert a ‘brown’ fat known as adipose ­tissue into energy to generate heat, the study said. Brown fat was previously thought to be present only in infants, playing a vital role in keeping them warm, but recent research found it also in adults. This latest study suggested that prolonged exposure to comfortable warm temperatures may permanently reduce the body’s ability to burn this brown fat. Brown fat, prevalent in the upper back and necks of most adults, consumes our calories when we are inside cooler rooms with temperatures in the low 60s or less. Lead author Fiona Johnson said: ‘Increased time spent indoors, widespread access to central heating and air conditioning, and increased expectations of thermal comfort all contribute to restricting the range of temperatures we experience in daily life. ‘This reduces the time our bodies spend under mild thermal stress – meaning we’re burning less energy. She called for health strategies to look at heating just as they currently look at other environmental factors such as diet and exercise. All is not lost—Johnson said individuals should turn down the heat today. Got to know new info from the article. Just received a payment for over $500.